We reject the premise that persons who are merely suspected of being undocumented immigrants should be rounded up by state and local police agents…. The overwhelming majority of immigrants, whether documented or undocumented, are not criminals. They simply need a job or need to flee from desperate situations. God has brought them before us – perhaps not in the way that you or I would have preferred for them to be brought before us – but they are before us now and we need to care for them. S.B. 4 is a direct attack on Texas values and hardworking Texas families. Approval of this harsh, “show me your papers”-style bill that drafts local criminal justice officials into becoming an arm of the federal immigration system marks one of the saddest days I have ever spent around the Texas Legislature…. Gov. Abbott’s signing of S.B. 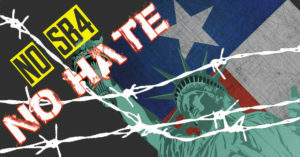 4 sent a larger message that Texas is OK with discrimination against immigrant families on the streets across our state. That message is dangerous and is drawing national attention. S.B. 4 is bad for working people, bad for business and bad for Texas. We believe there is broad consensus that the U.S. immigration system is broken. But S.B. 4 will simply increase discrimination and hardship rather than point toward comprehensive immigration reform. For President Patrick’s statement in its entirety, CLICK HERE.